Abbotsford, B.C. 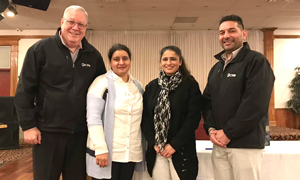 – February 2, 2019 – UFCW Canada Local 1518 members working at Rossdown Farms & Natural Foods have achieved their first contract, securing important gains that include better wages and more vacation. A fourth week of vacation for workers with 10 years of seniority or more. To read more about the new contract for members at Rossdown Farms & Natural Foods, click here. UFCW Canada Local 1518 represents over 20,000 members working in a diverse range of industries across British Columbia and the Yukon, including the retail food, community health, seasonal agriculture, and professional service sectors. To learn more about UFCW 1518, visit their website. How can I gain the benefits of a UFCW Canada contract? Are you a non-unionized worker who would like to enjoy the benefits of a UFCW Canada collective agreement? Do you and your co-workers want to gain the union advantage at work? Join Canada’s best union, UFCW Canada, and make your workplace better today. Click here to join now.